Monday was a big day in the house project. The inspector from the county came out and put his stamp of approval on the insulation. Now we are free to sprint (or jog) to the finish line. The inspector is finished until we are ready to hook up the electricity or pour the concrete on the porches. That seems like a big milestone to me. 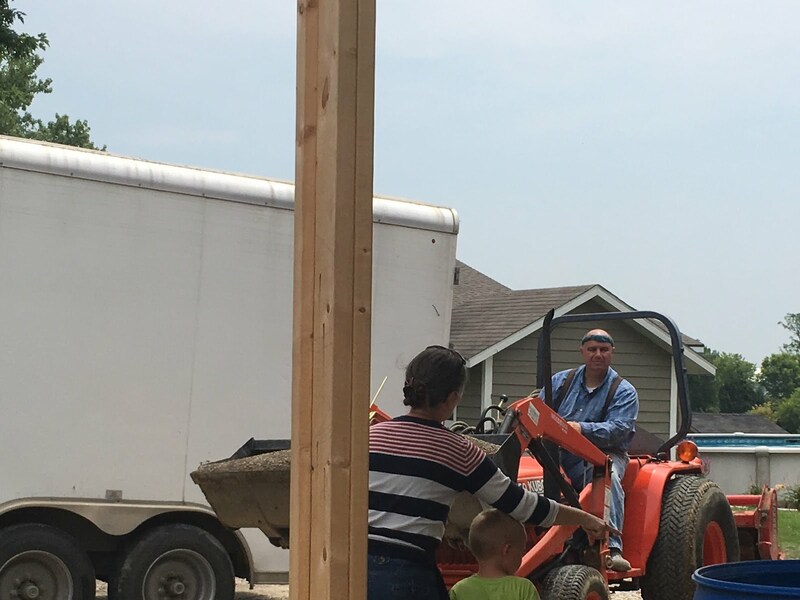 While we were busy last week with the insulation and all that was involved in that process, we had other things going on as well. We have been waiting on the plumber to hook up the water line to the house for several weeks. He was going to have to rent a backhoe to do it and had not been able to shake free to get it done. 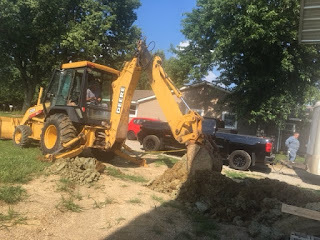 Kelly Jo noticed a backhoe next door at the Dodds Church so I walked over Wednesday morning and talked to the guy about maybe digging 15' of ditch. His name is Jamie Struewing and he came over about 5:00 after a long day of working at the church. 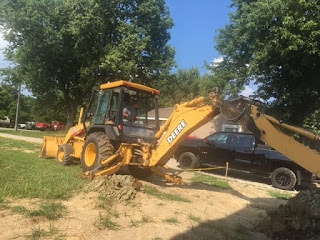 He looked at the situation and then brought his backhoe to the house. 40 minutes after placing his machine in position, he had the ditch dug. It was a tricky place to dig because of the porch roof but he handled it expertly. 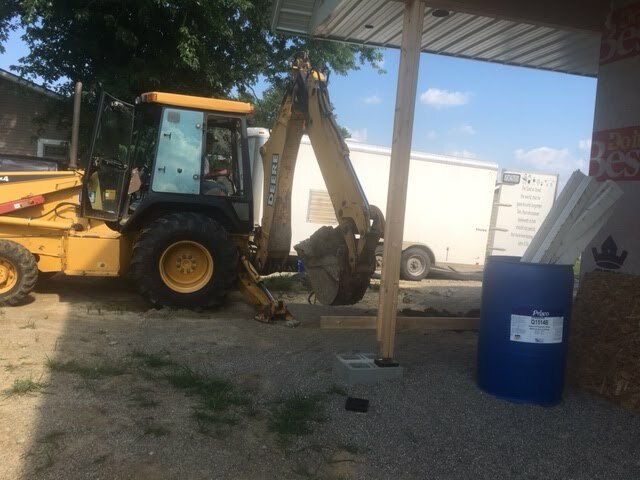 After I saw how close the backhoe had to be to the roof, I amd very glad we had a professional on the job. He also dug the ditch at a very reasonable cost. Thank you, Mr. Struewing. Thursday morning I told the plumber the ditch was dug so he sent his guys over to hook up the water line. The water company had strongly recommended using brass compression fittings when we initially put the water line in last November. I did not want to go to all of that trouble and expense and then let this last connection be the weak link, especially since this connection will be under the driveway. I sent Kelly Jo to Dayton to buy this coupling over a month ago so we had it ready to go. I was going to fill the ditch with gravel that evening but once we realized that storms were on the way, I jumped in and filled it shortly after noon. We finished just before the deluge. I did not get a picture of the finished ditch but I will try to take one this morning and add it to the post. We are very glad to get the water hooked up. We are at the point in the building process now where every step pushes it a little bit closer to completion. The water is a big step.